Okay... I seriously need to stop shopping online today, plus we really need to head out before the day is over, but I can't stop looking for the perfect shelving system. While surfing, I came across this LOVELY image of an IKEA kitchen that I absolutely can't stop staring at. 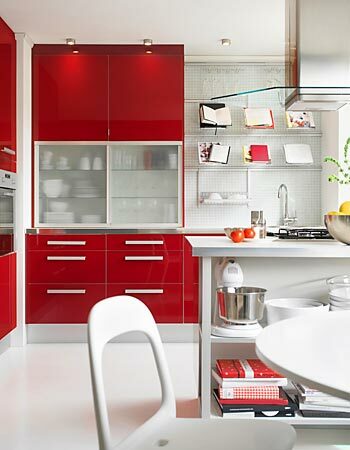 The red and white combo is fabulous; everything is in perfect balance so this candy apple color isn't too sticky sweet. I'm shocked that I'm drawn in to this space, I don't have one dot of red anywhere in my home, not even in my closet. In fact, I avoid red (and purple) at all costs. I love yellow and orange, but red, no thank you. BUT this room is the exception. It's seriously calling me in. It's also a big slap in the face because I needed a bit of a red wake-up call. I need to experiment with colors I dislike because it's often not the color itself, but the amount, tone, lighting, and other colors around it that make or break it. Perhaps I need to think outside of my comfort zone and experiment a little with pure 1960s mustang red. This kitchen is alive, it pops, it's sultry and there's nothing about this room that I'd alter. My aha moment of the day. Red really can be my friend. Do you have a color that you avoid at all costs? What is it? Why do you dislike it?